Scientists have found one storm that no umbrella can keep you safe from — because that umbrella is going to burn in your hand. While the windy and overcast weather of a stormy day isn’t surprising on telluric planets, it’s not something most of us readily associate with stars. But it does happen — the best evidence for this is W1906+40, a distant dwarf star recently described in a study published in the Astrophysical Journal. Being small for a star (about as big as Jupiter) W1906+40 is classified as an L-dwarf, more towards planets on the planet-star spectrum. The coolest stars in this class are known as brown dwarfs, “failed stars” that aren’t big or don’t have enough heat to sustain fusion and generate light as most stars do and resemble giant gas planets. However, they form very differently than planets and scientists often have to use the cosmic object’s age to classify it correctly. With an estimated 3,500 degrees Fahrenheit of surface temperature, W1906+40 might still have some fusion going on, but nothing powerful enough to stop mineral clouds from forming in its atmosphere, blurring the line between a planet and a star. But just like on Jupiter, the planet-and-star combination of features led to the formation of a massive storm. On Jupiter, the Great Red Spot has been churning and raging on for as long as humanity has been able to see it — some 400 years. It’s been slowly getting smaller and smaller, though it being roughly three times the size of Earth means the term “smaller” is used loosely here. 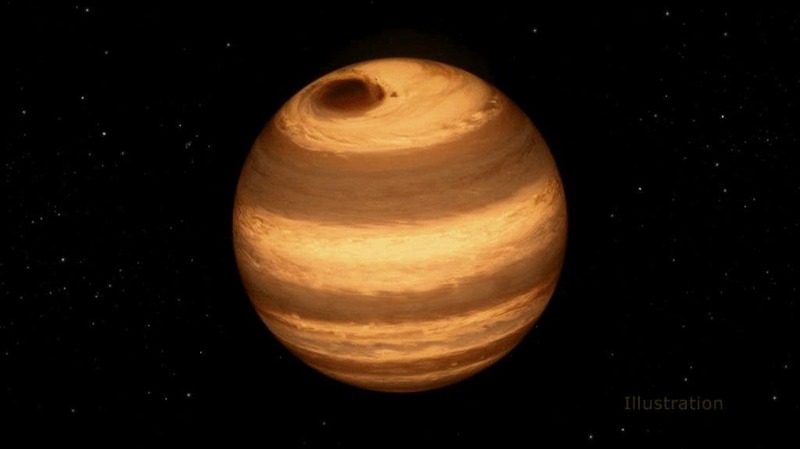 The storm on W1906+40 was spotted using the Kepler exoplanet hunting telescope. It searches for exoplanets by measuring the dimming of distant stars’ light, which can be used to determine if there are any objects passing in front of it. In the case of W1906+40, Gizis and his team saw a dark spot that didn’t waver. This wasn’t unusual — patches of concentrated magnetic field can make dark blotches on a star’s surface known as star spots (on sunspots on the Sun,) behave the same way and are relatively common. But further investigation in infrared light revealed that the dark spot had nothing to do with magnetic fields. The whopping storm makes a dark mark on top of the star, rotating around it about every nine hours. Scientists aren’t sure why these storms last so long or how common they are, but the researchers involved in the study plan on seeking out more stormy dwarfs to learn more.